Is your dog on a hypoallergenic diet and it is not working? Let Holistic Pet Cuisine introduce you to a new food for your dog. Available at Holistic Pet Cuisine in Boca Raton, Florida and available to be shipped out to your home. All new novel protein available to those dogs that have tried everything to correct a stubborn food allergy. Give your dog an opportunity to get off the veterinarian diets and onto a healthy and holistic product that will boost your dogs immune system through food and not medicine. Pure and simple nutrition just got even better. As the first company to create a dry pet food without grains, Natura is now bringing even more options to pet parents with our California Natural grain free varieties. 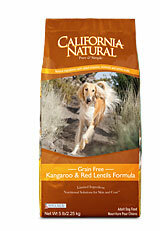 California Natural Grain Free Kangaroo & Red Lentils Formula Adult Dry Dog Food is carefully made with ingredients that are specifically selected to be tasty, easy to digest, nutrient-rich and grain free. Kangaroo is used as the single animal protein source, providing an uncommon protein option for dogs who cannot tolerate typical pet food choices. Red and green lentils and peas are included to provide unique carbohydrate sources with low glycemic indexes, along with sunflower oil and flaxseed which supply essential omega-3 and omega-6 fatty acids for skin and coat health. The formula is grain free and potato free, making it a great option for pets who do better on a limited ingredient diet. Pet professionals agree that high-quality, wholesome and minimally processed ingredients are an important key to optimum health. Maximizing pure nutrition and minimizing concerns over grains, it’s these special qualities that make California Natural Grain Free Kangaroo & Red Lentils Formula Adult Dry Dog Food the perfect choice for your dog! California Natural Grain Free Kangaroo & Red Lentils Formula Adult Dog Food is formulated to meet the nutritional levels established by the AAFCO (Association of American Feed Control Officials) Dog Food Nutrient Profiles for maintenance. Holistic Pet Cuisine where nutrition is key!